Here we provide a guide to the wide range of tools available to support all stages of adaptation planning and implementation. A wide range of adaptation support tools, frameworks and portals have been developed around the world. We have identified a number of useful tools to support adaptation planning and implementation. These are listed in a searchable database of 63 tools. The database provides key information about each tool, including its broad purpose, how it can be accessed, any cost, data requirements, level of expertise required to operate etc. 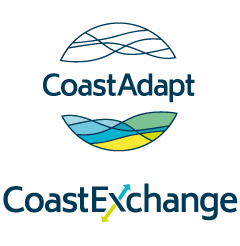 These tools can be used at different steps of CoastAdapt’s decision support framework Coastal Climate Adaptation Decision Support (C-CADS). They can also be used independently of C-CADS. What are ‘climate change adaptation support tools’? Adapting effectively to climate change entails undertaking a number of activities (e.g. data collection and analysis, risk assessment, planning, implementation). These activities can be supported by adaptation support tools. Here, we provide in a spreadsheet a guide to a number of tools we have identified as potentially useful, that have been developed within Australia and overseas. These tools can be used within C-CADS (the decision support framework provided within CoastAdapt, see Figure 1), or they can be used independently. Figure 1: Examples of tools that can be used at different C-CADS steps. Some are broader in scope and can be used at multiple steps of C-CADS. Some are sector specific. There is an expanding number of climate change-related tools, and we did not aim to capture them all. Rather, we concentrated on those relevant to the adaptation process, including planning implementation and evaluation. We conducted online searches and reviewed scientific articles, research papers and government reports that discuss climate change adaptation-related tools (Aldum et al. 2014; Hammill and Tanner 2011; Hosking 2014; Schipper et al. 2010; UNFCCC 2009; Webb and Beh 2013). In the selection, we prioritised national and regional Australian tools over international ones, as we considered they would be more relevant. A small number of important international tools are included, particularly ones that include information or analysis software that are applicable to, and potentially useful in, the Australian context. We identified 63 tools. These are presented in a searchable Excel spreadsheet. The main features of this spreadsheet are listed in Table 1. Our aim in the spreadsheet is to outline key information to help users gain a preliminary idea about the tool, its broad purpose, cost and data-requirements. The goal is to provide a broad idea about what kinds of tools are available to support coastal adaptation planning. A qualitative (and subjective) description of the expertise requirement to use the tool (high, moderate, low). impacts of climate and climate change on individual sectors: Infrastructure, tourism, marine life etc. knowledge-sharing platforms for example, Terranova from Australia and US Resilience Toolkit and weADAPT from overseas. analysis or visualisation of climate change and sea-level rise data ; this is the largest category, with seven examples. cost-benefit analysis to evaluate adaptation options. exploration of the physical attributes of the coast, for example its erodibility. Finally, there are some analysis tools, mainly international, that enable you to look more broadly at adaptation processes and planning, for example from CARE International, and the ClimateAPP tool from DeltaRes in The Netherlands. These adaptation process tools guide users through the implementation of one or several steps of an adaptation process. There are nine examples in the spreadsheet, including six from Australia and three from overseas (two from the UK, and one from the World Health Organisation). Within Australia, there is an emphasis on adaptation at the local council level, and three of the tools are provided by state governments or local government associations for use primarily by their local councils. Selection of a tool depends on the requirements of the user (i.e. the nature of the problem to be solved) and on resource availability (e.g. data, expertise, time, etc.). The following general steps can help in systematically selecting an adaptation tool (Rozum and Carr 2013). Characterise the adaptation question(s) (e.g. sector, risk, goal, timescale, geographical scale). Identify the function the tool should perform (e.g. process guidance, analysis tool, visualisation, data extraction). Research the available tools: the attached searchable database of 63 tools is a good starting point to investigate how well your desired functionality and outputs align with the functionality and outputs of individual tools. Assess data and sectoral expertise needed (e.g. data requirement, whether expert guidance needs to be sought). Assess the available internal capacity (compared to the level of expertise required to operate the tool). The number of tools available is growing rapidly which means there may be new tools available that we haven’t included in the spreadsheet. It is important to properly scope the range of tools available by consulting experts and conducting web searches. The same tool may be useful at different stages of the adaptation process; for example, some of the process guidelines in the spreadsheet may provide support through scoping, planning and implementation. There may not be an exact match between your specific project needs and an ‘off the shelf’ tools. You may need to weigh the costs and benefits of using existing tools that are not an exact match. If datasets and additional information are required for a tool, then you need to consider any costs involved (in time and money), the reliability of available datasets, and how feasible it might be to generate your own data. Lack of having ‘perfect’ data should not hold up adaptation planning, as adaptation plans can (and should be) iterative, with the capacity to be revised/amended as new information/data arise (see Pathways approach). If a tool looks ideal for your purpose, but there is a lack of in-house capacity to use it, it’s worth contacting the tool developer to explore any possible collaboration or technical assistance. Aldum, N., J. Duggie, and B. Robson, 2014: Climate change adaptation support tools in Australia. Regional environmental change, 14, 401-411. Hammill, A., and T. Tanner, 2011: Harmonising climate risk management: Adaptation screening and assessment tools for development co-operation. OECD Environment Working Papers, No. 36, OECD Publishing. Accessed 24 June 2016. [Available online at http://www.iisd.org/pdf/2011/5kg706918zvl.pdf]. Hosking, C., M. Mills, and C. Lovelock, 2014: Summary of Biophysical Data for the East Coast Cluster NRM groups: Tools/Models, Map and General Information. Prepared for the East Coast Cluster Climate Change Adaptation for Natural Resource Management in East Coast Australia project. University of Queensland, Global Change Institute, St. Lucia, Queensland, Australia. Accessed 24 June 2016. [Available online at https://terranova.org.au/repository/east-coast-nrm-collection/summary-of-biophysical-data-for-climate-change-adaptation-for-the-east-coast-cluster/fitzroy-nrm-biophysicaldata-july2014.pdf]. Rozum, J.S., and S.D. Carr, 2013: Tools for Coastal Climate Adaptation Planning: A guide for selecting tools to assist with ecosystem-based climate planning. NatureServe. Accessed 24 June 2016. [Available online at https://connect.natureserve.org/sites/default/files/documents/EBM-ClimateToolsGuide-FINAL.pdf]. Schipper, L., W. Liu, D. Krawanchid, and S. Chanthy, 2010: Review of climate change adaptation methods and tools. MRC Technical Paper No. 34, Mekong River Commission, Vientiane. Accessed 24 June 2016. [Available online at http://www.mrcmekong.org/assets/Publications/technical/Tech-No34-Review-of-climate-change.pdf]. UNFCCC (United Nations Framework Convention on Climate Change), 2005: Compendium on methods and tools to evaluate impacts of, and vulnerability and adaptation to, climate change. Accessed 24 June 2016. [Available online at https://unfccc.int/files/adaptation/methodologies_for/vulnerability_and_adaptation/application/pdf/consolidated_version_updated_021204.pdf]. Webb, R., and J.-l. Beh, 2013: Leading adaptation practices and support strategies for Australia: An international and Australian review of products and tools. National Climate Change Adaptation Research Facility, Gold Coast 105pp. Accessed 24 June 2016. [Available online at https://www.nccarf.edu.au/publications/leading-adaptation-practices-and-support-strategies]. What is the least I can do for adaptation?